Buffalo, New York native Thom Lehman may no longer be pitching for the Hurricanes, but his legend lives on. One of the greatest pitchers in Hurricane history, Lehman is still among the top ten in four all-time Hurricane pitching categories. Lehman began his career with the Canes in 1967. While platooning between the bullpen and a starting role, he logged a 4-0 record and a 2.70 ERA in 16 appearances. In his junior year Lehman became the number one pitcher in rotation, a position he would retain throughout the remainder of his career at UM. 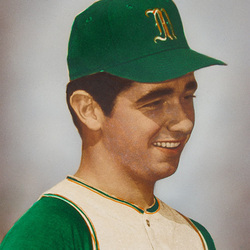 He started 15 games, notching a 12-2 record on the strength of 8 complete games, one shy Warren Bogle's then-record of for complete games in a single season. Expectations abounded as Lehman entered his final season as a Hurricane. The future draft pick of the Houston Astros did not disappoint anyone, going 10-3 with an ERA of 2.35 and leading the Hurricanes to a 31-11 season record. Tom Lehman will remain as one of the finest pitchers in Miami baseball history.